1- To whom correspondence should be addressed. Email: malcolm.logan@kcl.ac.uk. The sternum bone lies at the ventral midline of the thorax where it provides a critical attachment for the pectoral muscles that allow the forelimbs to raise the body from the ground. Among tetrapods, sternum morphology is correlated with the mode of locomotion: Avians that fly have a ventral extension, or keel, on their sterna, which provides an increased area for flight muscle attachment. The sternum is fused with the ribs attaching on either side; however, unlike the ribs, the sternal precursors do not originate from the somites. Despite the crucial role of the sternum in tetrapod locomotion, little attention has been given to its acquisition, evolution, and embryological development. We demonstrate an essential role for the T-box transcription factor gene Tbx5 in sternum and forelimb formation and show that both structures share an embryological origin within the lateral plate mesoderm. Consistent with this shared origin and role of Tbx5, sternum defects are a characteristic feature of Holt–Oram Syndrome (OMIM 142900) caused by mutations in TBX5. We demonstrate a link between sternum size and forelimb use across avians and provide evidence that modulation of Tbx5 expression underlies the reduction in sternum and wing size in a flightless bird, the emu. We demonstrate that Tbx5 is a common node in the genetic pathways regulating forelimb and sternum development, enabling specific adaptations of these features without affecting other skeletal elements and can also explain the linked adaptation of sternum and forelimb morphology correlated with mode of locomotion. The fin-to-limb transition and acquisition of sterna were critical steps in the evolution of tetrapods, but despite the importance of the sternum in enabling quadrupedal locomotion and avian flight, the mechanisms controlling acquisition and evolutionary adaptation of sterna are not understood. Furthermore, the mechanisms that underlie sternum development and sternal defects are not known. We describe T-box transcription factor gene Tbx5 function in sternum formation, how disruption of TBX5 causes human sternum defects, and how modulation of Tbx5 was key to acquisition and adaptation of sterna in vertebrates. 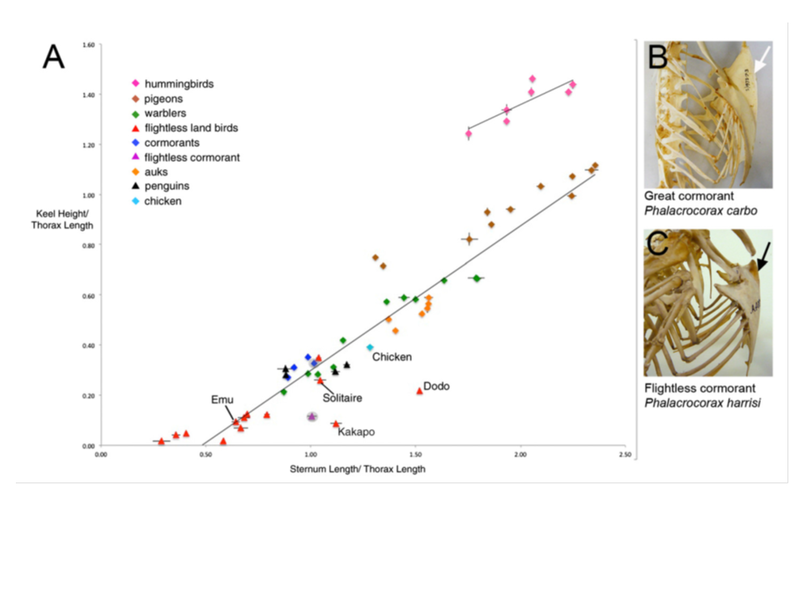 We also demonstrate a quantitative correlation between sternum dimensions and forelimb use in avian species. Fig. 1. Sternum length and keel height are correlated with mode of locomotion in avians. (A) Scatterplot of measurements for sternum length and keel height, normalized for bird size by dividing by thorax length, for a range of bird groups. Each point on the graph represents one species. When possible, multiple specimens were measured per species. Error bars show SE between multiple specimen measurements. Flying species are represented as diamonds; flightless species as triangles. Thoracic skeletons of volant cormorant (Phalacrocorax carbo) with the keel indicated (white arrow) (B) and flightless cormorant (Phalacrocorax harissi) with the reduced keel indicated (black arrow) (C).